Contentment is hard work. It is easy to take for granted the blessings God has given me. 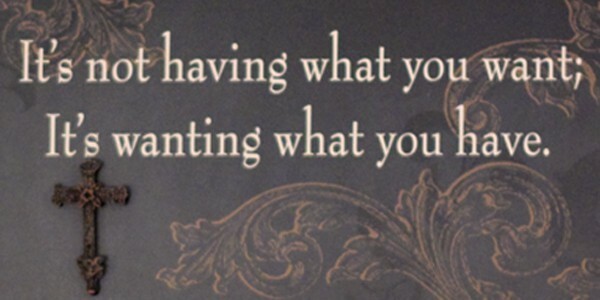 Instead of being grateful I become greedy. Recently I found myself continually dwelling on areas of discontent in my life instead of reflecting on my abundant blessings. I knew that my attitude was wrong, but I could not get on top of my poor attitude. I committed to striving for change while focusing on God’s word concerning contentment during Lent. In that time, God shed light on my grumbling heart and led me to strategies that changed my attitude to one of gratefulness and thankfulness. I’d like to share the practical things I learned over those 40 days, because it seems that everyone, no matter how perfect their life looks from the outside struggles with finding contentment somewhere. In Philippians, Paul says he has found the secret to being content in any situation. I kept coming back to these verses and leaving frustrated. I wanted to sit down, talk with Paul, and entreat him to tell me the secret to contentment! I know the short answer is a relationship with Jesus yet, I needed more. Even as I was praying about being content my mind kept dwelling on areas of discontent. So, what are the secrets to being content? #1 Rejoice and give thanks! When continually rejoicing there is no time or space for discontent. Each time a discontented thought comes, push it away by countering it with praise. Seek out and give thanks for the positives in the situation. When I think, “I wish we had a bigger house” I counter with praise for a house that meets our needs and remind myself that a small house is easier to keep clean, giving me more time for my family. #3 Guard your mind! If there is something in life that brings discontent then get rid of it! Specifically, watch out for television, internet, print, and social media that brings envy and jealousy. For me, that means skipping magazine articles about buying a ‘budget’ outfit for a hundred bucks, because that isn’t my reality. If I stay away from those articles I remain content with my wardrobe. Cut out anything that skews the view from contentment to discontent! #4 Get busy! Staying busy makes it difficult to dwell on negative thoughts. There are situations that cannot be changed. If this is the type of situation bringing discontent, get busy elsewhere. Focus on other things that need attention. If changing the situation is possible, start preparing for it. For me, I know that having a photography business is far in the future, instead of dwelling on camera equipment I can’t afford, or time away from home that I don’t have, I can get busy learning and practicing. Finally, remember, God has a plan even during a difficult season in life.